문제가 발생하였거나 제안 사항이 있으면 ftp at ftp.kaist.ac.kr로 연락해 주십시오. 서비스 공지 사항은 트위터 @kaist_ftp에서 확인할 수 있습니다. 미러의 모든 업데이트 및 업데이트 중 발생한 문제점에 대한 피드를 제공합니다. 더 많은 정보를 보려면 거울 프로젝트 사이트를 방문하십시오. 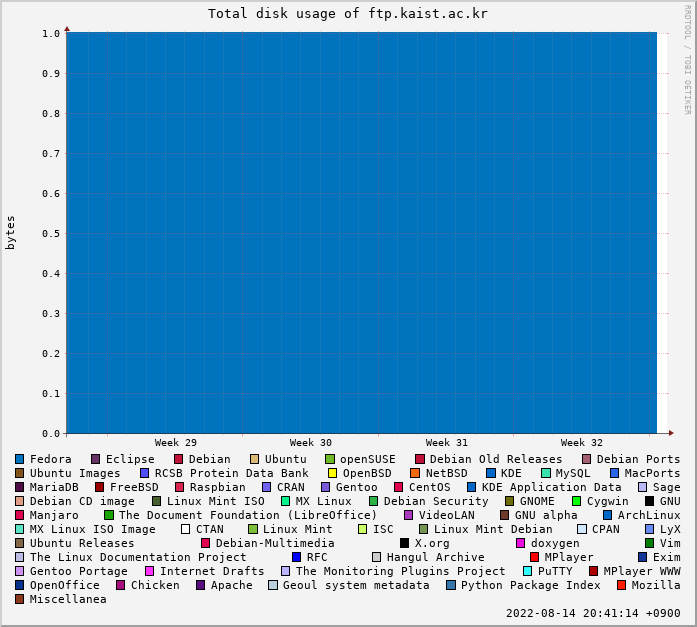 KAIST 파일 서비스, ftp.kaist.ac.kr에 오신 것을 환영합니다! Debian, *BSD, Mozilla, Apache 등 오픈 소스 소프트웨어 미러링 및 여러 파일과 소프트웨어의 미러링 서비스를 제공합니다. FTP, HTTP, rsync로 접근할 수 있습니다. 대한민국 대전 KAIST 교양분관에 있는 SPARCS 서버실에서 운영 중입니다. 전체 저장소는 18TiB RAID-6이며, Dell PowerEdge R510 (Xeon E5506, 24GiB RAM, 2 x 1Gbps) 서버를 사용합니다. 네트워크 연결은 KAIST에서 제공하며, 서비스 운영은 SPARCS에서 담당합니다. 시스템의 운영 체제는 Debian GNU/Linux이며, lighttpd, rsync, vsftpd 등의 자유 소프트웨어를 사용하고 있습니다. 세부 사용량 통계 보고서에서 더 자세한 내용을 확인할 수 있습니다. KAIST 파일 서비스 운영자는 서비스에 대한 가능한 모든 법적 책임을 지지 않습니다. KAIST 파일 서비스 운영자는 이 서비스로 인하여 발생될 가능성이 있는 문제에 대하여 책임을 지지 않습니다. 서비스 사용 기록은 자동으로 수집되며, 서비스의 품질 개선 및 통계 분석 목적으로 사용될 수 있습니다. 서비스 개선을 위하여 이용에 제한이 가해질 수도 있습니다. We provide mirrors of open source softwares, e.g. Debian, *BSDs, Mozilla, Apache, etc. and publically available files and software. 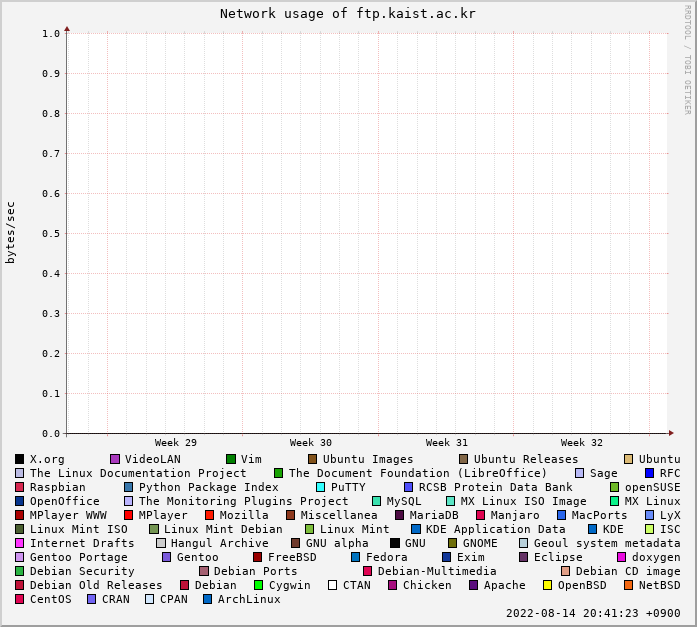 Various access methods are available: FTP, HTTP, Rsync. This system is running at SPARCS Room, KAIST, Daejeon, Korea, Asia. We are operating 18TiB RAID-6 storage on Dell PowerEdge R510 (Xeon E5506, 6GiB RAM, 2 x 1Gbps) server. KAIST sponsored hardware and network connectivity. SPARCS operates the whole service. We run our services using robust, free or open source software, including but not limited to lighttpd, rsync, and vsftpd on the Debian GNU/Linux operating system. Use entirely at your own risk -- no warranty is expressed or implied. None of the service providers in any way whatsoever can be responsible for any problems that might be caused by this service. Every access to this service is recorded and can be used and published for the purpose of improving the quality of the service. We may limit any accesses without forewarning that may prevent operators from maintaining reasonable quality of the service. Contact us via email for any problem or suggestion.